1) This paper has been presented at the XXIV FIG Congress in Sydney 11-16 April 2010 in the session on Vertical Reference Frame. The paper is a peer reviewed paper. Handouts of this presentation as a .pdf file. John Hannah is a Registered Professional Surveyor and is a former President of the NZ Institute of Surveyors. Climate change has a variety of important impacts, one of which is reflected in sea levels. Indeed, long term rising trends in global sea levels are often used to corroborate the assertion of long term climate change. When tide gauge records are examined in order to determine the long-term trends in sea level it is typical for a single number representing the derived trend, to be quoted. However, the problems in deriving such numbers are rarely, if ever, discussed. Indeed, there appears to be a widespread ignorance as to the fragility of tide gauge records and hence the accuracy of derived long-term sea level trends. This paper uses specific examples from New Zealand to illustrate and explain the problems that exist in deriving an accurate figure for the eustatic changes in sea-level at a tide gauge site. It highlights the importance of assessing accurately the influence of anthropological factors, changes in tide gauge datums, and geophysical effects. These factors, which can compromise or even completely invalidate a record, must be able to be assessed over the entire history of the tide gauge record (often 100+ years). This paper, after exploring these factors and their potential influence, concludes by making recommendations on procedures to be followed if we are to leave future generations better quality sea level data than is often available at present. Sea level change is an important climate-related signal, studies of which have featured in all recent International Panel for Climate Change (IPCC) scientific assessments (e.g., IPCC, 2001; IPCC, 2007). In undertaking sea level change analyses, the data is typically drawn from the Permanent Service for Mean sea Level (PSMSL) database at the Proudman Oceanographic Laboratory. For each tide gauge this data is used to derive a figure for sea level rise. In order to correct the derived figure so that it reflects the eustatic component of sea level rise, a great deal of attention has been given to the task of separating the motion of the land and wharf structures (to which the tide gauge is attached), from the observed sea level rise signal. This has resulted in the increasingly widespread collocation of GPS receivers with tide gauges (c.f., Woppelman, 2007). In addition to these land based studies, satellite altimetry has advanced to the point whereby TOPEX and JASON 1 time series are now being used to assess long term sea level changes over the open oceans. Such studies, while separate from the land based tide gauge studies, are not independent in that the data from certain coastal tide gauges have been used for altimeter calibration purposes (e.g., Chambers et al, 1998; Nerem and Mitchum, 2001). In nearly all of these studies, the tide gauge data is typically assumed to be high quality and not subject to question. This important assumption is rarely, if ever challenged. However, if such a high quality record is to be obtained it is essential that issues such as the datum history of the tide gauge and local wharf movements be well documented and verified. Given that many gauges are located in port facilities where wharf removal, development, and/or extensions occur, this is easier said than done. Indeed, New Zealand experience indicates that some primary gauges have been renewed, replaced or changed at least five or six times in their 100 year history. In addition, it is not uncommon for tide gauges to malfunction for significant periods of time thus offering the possibility of a (potentially) biased tidal record. This study, then, attempts to highlight the importance of the above factors, giving specific examples of how the analyses of New Zealand’s long term sea level trends have been influenced by them and illustrating how a record can be invalidated by poor information. While the examples have been drawn from New Zealand experience, they illustrate problems that are generic in nature to much of the available tide gauge data. Other issues that arise in long-term sea level change analyses include the influence of geophysical effects and the length of the tide gauge record, Douglas (1997) pointing out that a gauge record needs to be at least 60 years in length if incorrect estimates of sea level change are to be avoided. The paper concludes by making some practical recommendations on procedures to be followed if future generations of investigators are to be left higher quality, long term data sets than are currently available. Most pre-1980 sea level data have been collected from float activated tide gauges, an example of which is shown in Figure 1 below. The sea enters the float chamber via a small orifice at the bottom. The orifice (and chamber), act as a mechanical low-pass filter that eliminates high frequency wave action. As the float rises and falls with the tide, it is connected by a pulley mechanism to a mechanical recording device that in turn causes the tidal signal to be traced out on a paper graph. The paper graph rotates (typically on a drum), that is in turn driven by a mechanical clock. Much of the historical tide gauge data held by the PSMSL will have been collected off paper charts produced by such devices. Sediment collecting in the bottom of the stilling well. This was often evidenced by a flattened low water tidal curve – the float would sit on the sediment at or near low water and fail to delineate the change in the low water tide. Due to the biases likely to be introduced, data demonstrating this behavior needs to be rejected from any subsequent sea level trend analysis. Friction in the float mechanism. The tidal constituents used in harmonic analysis are comprised of the amplitude and phase of a combination of cosine functions superimposed upon each other (cf.,Pugh, 2004). The rate of change in the tide is zero at high and low water and very close to zero in the near proximity. Excess friction in the float mechanism (perhaps due to lack of maintenance) results in the float ”sticking” at these points thus creating an arbitrary flattening of the tidal curves at both high and low tide. In the recent digitization of the sea level data at New Plymouth, for example, this lack of definition was sometimes observed for days on end. Unless there is a symmetry in these effects about the mean tide, data demonstrating this type of behaviour should also be rejected. Clock errors. This problem arises either when the clock has been incorrectly set or because it drifts with time. It is not uncommon to find errors of one hour or more in the record. In mid-latitude regions, such as New Zealand, this can easily produce a difference between the observed tide (as delineated on the tide chart), and the predicted tide of 700 mm – 800 mm. In reality, however, these timing errors have little influence on the monthly and annual sea level means that are used in long-term sea level trend studies. Gauge setting errors. 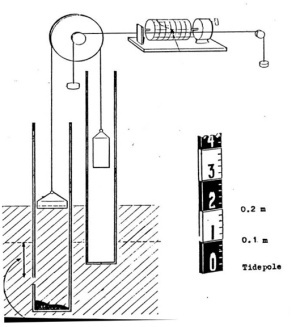 The traditional mechanism for calibrating a float activated tide gauge was to observe the water level on the tide pole adjacent to the gauge and then to ensure that this reading was reflected on the chart record. Some old gauges (e.g., Foxboro gauges) could be set to little better than 0.2 ft. Setting errors of 0.2 ft – 0.3 ft (0.06 m – 0.09 m) appear to have been reasonably common. Such settings would typically occur when the paper tide graphs (rolls) were changed (i.e., anywhere between every two weeks and two months). Assuming a standard deviation for the gauge setting of 0.25 ft, (0.076 m) and a setting interval of one month, then the contribution of this error to the standard deviation associated with an annual MSL could be expected to be in the order of 0.022 m.
In recent years mechanical tides gauges have been replaced by electronic tide gauges whereby the sea level is sensed by bouncing an electronic signal off the water surface to an associated sensor unit either above or below. Typically, a burst of readings are made over a short time period (say 30 sec) and a mean figure for the sea surface obtained. This occurs at some predetermined interval such as 10 minutes. Such gauges are thus capable of producing much higher frequency, and more precise data than was possible from the old tide charts. Other gauge types exist such as pressure gauges and “bubbler” type gauges. Douglas (2001) provides a brief summary of these. However, even with electronic gauges, the calibration problem (equivalent to the gauge setting error) remains. In addition some, such as the quartz crystal pressure gauges, can drift severely with time. Indeed, New Zealand experience with one such pressure gauge at Cape Roberts in the Antarctic has shown that a calibration interval of two to three years is inappropriate – the data being so contaminated with drift errors as to be essentially unusable. While a calibration period of at least six months is preferred, logistical constraints have limited the calibration of the Cape Roberts gauge to 12 monthly intervals. New Zealand experience further indicates that the most important issue in obtaining high quality monthly or annual MSL data is the care and maintenance of the gauge. Poor maintenance is often indicated by long periods of gauge outage, frequent breaks in the tidal record, timing errors and poor curve definition at high and/or low water. Where a gauge has been well maintained (such as with the Auckland and Wellington gauges), a posteriori error analysis undertaken on the full sets of digital data collected over 100 years indicate that an annual sea level means should be able to be given a standard deviation of between 0.020 m and 0.025 m (Hannah, 2004). In attempting to derive a long-term sea level trend, datum errors, generally arising from anthropological factors, are by far the most important to resolve. Unlike gauge errors that are greatly reduced by the quantity of data collected and the resulting meaning process, datum errors can be subtle, tend to be systematic and, if not correctly resolved, will completely invalidate a sea level record. Such errors can arise from the following sources. When tide gauges are shifted from one wharf structure to another and the new gauge zero differs by some unknown (or unrecorded) quantity from the previous gauge zero. In recent attempts to reconstruct the tidal record at New Plymouth it has become apparent that the tide gauge had been moved from one wharf to another at least four times since 1918. In the case of the Wellington gauge, written records indicate that the gauge was moved between 1944 and 1945, but there is no record of a datum shift. The MSL data before and after that date indicate with some clarity that such a datum shift occurred (c.f., Hannah, 1990). An analysis of the data indicated that the shift was in the order of 0.025 m.
When a tide pole is replaced and the new pole is set at a different level than the previous one. When it remembered that the tide pole is the means by which tide gauges have historically been calibrated, then it becomes clear that any unrecorded shift in the tide pole will immediately translate into an unrecorded datum change. Tide poles, which are attached to wharf structures, can easily be damaged by vessels and are often obliterated by oil and other port debris. It is likely that even a well built tide pole will require replacement on a 20 year cycle. A recent detailed analysis of the records relating to the well maintained Lyttelton gauge, indicates unrecorded variations in the position of the tide pole of 0.08 ft (0.024 m) over a 40-year period. The dates when specific changes occurred are not known. In reality the tide pole is the fragile link that holds a tidal record together. If the position of the tide pole has not been monitored throughout the history of the tidal record then the record must be subject to question as must the accuracy of any subsequent long-term sea level analysis. When there is no consistent history of leveling from stable benchmarks to the tide pole. Any local subsidence in a wharf structure (and thus in the attached tide pole or tide gauge) will only be detected if there has been a consistent history of leveling to stable local benchmarks. For example, for many years, and in earlier sea level analyses the Wellington gauge was assumed stable (Hannah, 1990). However, by 2003, a sufficiently long time series of local leveling data had been collected so as to indicate an apparent long-term subsidence in the wharf structures of about 0.15 mm/yr (Hannah, 2004). Conversely, at Dunedin, it has only become clear recently that certain local bench marks are subsiding while the wharf structures remain stable. The 2004 analysis of long-term sea level change, which assumed both were subsiding, gave a result of a sea level rise of 0.94 mm/yr (Hannah, 2004). The most recent analysis (with this erroneous assumption corrected), now shows a sea level rise of 1.3 mm/yr – a very significant difference. Changes in the setting of the gauge datum. It is altogether possible that a gauge may exhibit none of the above three problems but yet still exhibit obvious datum shifts. This typically happens when some new (or different) figure is adopted for a gauge datum and when the tidal recording device is reset accordingly. At New Plymouth, for example, it is clear that changes in the gauge setting of 1.0 ft (0.305 m), 1.5 ft (0.457 m), 2.0 ft (0.610 m) and 3.0 ft (0.914 m) all occurred in the space of 10 years. In two such cases there was no clear record of exactly why or when this had happened. Indeed, it appears that there was some confusion between the Port Authority (the owner and operator of the gauge) and the national surveying and mapping organization (responsible for the tidal predictions), as to what datum offset should have been set. In summary, the New Zealand experience is clear. Given a reasonable tidal record over a long period of time, a clear and unambiguous datum history is the single most important issue to be resolved if there is to be a reliable estimate for long-term sea level change. It is around this issue that the greatest risk of unwarranted assumptions of reliability and consistency exist – particularly from those who may not be intimately familiar with the specifics of the history of a particular gauge. While datum errors tend to be the most difficult to resolve (due to the need for good record keeping over periods of many decades), analysis errors, or other unmodelled systematic effects, can also intrude. The removal of the tidal signal by a low-pass filter and by averaging techniques is very effective. Other fluctuations in sea level such as those arising from shallow water effects, storm surges and wind set-up, while not easily modeled, are effectively eliminated by using monthly and annual sea level means. However, there is real danger in seeking to resolve accurately long-term sea level changes from data sets of less than 60 years in length. Douglas (2001), for example, summarises research showing that large variations in the estimates of sea level rise can be explained in nearly all cases by the selection criteria used by a particular investigator – short records being one of the most important. It is vital that the periodic effects from such signals as inter-decadal variability be eliminated (Holgate and Woodworth, 2004). Studies in New Zealand by Goring and Bell (1999) and by Bell et al (2000) reveal the importance of the Inter-decadal Pacific Oscillation (IPO) and the El Nino Southern Oscillation (ENSO) on sea level variability at Auckland and Tauranga. Indeed, it has been speculated that such effects might extend as far south as Lyttelton. A second analysis problem that can arise relates to the influence of unmodelled hydrological effects. The Hunter River, for example, has had an influence on the data produced by the Newcastle tide gauge on the East Coast of Australia. Equally, one of New Zealand’s longest tidal records (Westport) was compromised by similar effects. The Westport gauge sits at the mouth of the Buller River. If climate change brings with it changes in rainfall patterns (as is expected to happen), then the prospect exists for apparent sea level change to be masked or exacerbated by changes in river flow. Early sea-level change analyses showed wide variation in result (e.g., Gornitz, 1995). However, much of this variation was subsequently able to be explained by ensuring that the tide gauge records used met five criteria. These were: (1) that the records be at least 60 years in length, (2) that they not be from sites at collisional tectonic plate boundaries, (3) that they be 80% complete or better, (4) that at low frequencies they be in reasonable agreement with nearby gauges sampling the same water mass, and (5) that they not be from areas deeply covered by ice during the last glacial maximum (Douglas, 1997). Reasons (2) and (5) are the issues addressed in this section. New Zealand sits astride the boundary between the Pacific and Australian tectonic plates. The lateral movement between these plates is known to be in the order of 35-40 mm/yr (Bevan et al, 2002). Of the four New Zealand tide gauges with 80 or more years of data, three (Auckland, Lyttelton and Dunedin) sit well away from the collision zone. Only the gauge at Wellington sits within the zone. Hannah (1990) has argued that the high level of coherence between the long-term sea level trends at these four gauges provides some comfort in the view that the differential vertical uplift between these four gauges (should it exist) is relatively small. However, until a sufficiently long time series of data is available that provide accurate estimates of regional vertical tectonic uplift, the influence of such effects remains unknown. The second geophysical effect to be considered in the interpretation of any tide gauge record is that of glacial isostatic adjustment (GIA). Vertical motions from this effect are estimated by using a geophysical model (e.g., Peltier, 2001), the size of the motion varying according to the model adopted. For example, GIA estimates for Auckland range from 0.1 mm/yr (from the ICE4G (VM2) model to 0. 55 mm/yr (from the JM120,1,3 model). Similar levels of variability in estimate are found at other New Zealand tide gauges. It is encouraging to note that the above two issues now show real promise of resolution. While not able to be separated readily, it is anticipated that their total effect will be able to be estimated by the use of GPS receivers installed alongside (or in close proximity) to tide gauges. It is the expectation that the daily position solutions from these receivers, when examined over long periods of time (10 years or longer), will allow an assessment to be made of any absolute land motion whether it be from tectonic or GIA causes. In New Zealand GPS receivers have been collocated with the tide gauges in the Ports of Auckland, Wellington, Lyttelton and Dunedin since 1999. The tide gauge records at each of these ports extend back to 1900. Preliminary results indicate that the regional land motion is in the order of 1.00 mm/yr (Denys et al, 2009). At this time experiments are underway to determine final strategies for processing the GPS data. In looking to future long-term sea level change analyses, it is crucial not only that reliable tide gauges be maintained at existing sites where long records exist, but also that any datum changes be carefully determined and recorded. In some cases this may require the negotiation of agreements between port companies (typically with commercial objectives) and national science/research agencies (with research objectives). In New Zealand, in the 1990s, the failure to resolve these issues adequately has had a damaging impact on some tide gauge records. The recent resolution of these issues has improved the situation considerably. However, constant vigilance is required. Nowhere is this better illustrated than at Auckland where the tide gauge has been moved three times since 2000 and where links to stable local bench marks have not been adequately maintained due to local construction activities. The installation of CGPS receivers on or beside tide gauges a decade ago now opens the possibility for an independent assessment of any vertical land motion irrespective of cause. Having come thus far, it is vital that such initiatives continue. Longevity of data set is a crucial factor in accurate and sound future scientific analysis as is consistency and accuracy in processing strategy. It is an easy matter to adopt a tide gauge record from a national or international database without any real thought as to its overall quality. While temporary (or short term) operational difficulties in collecting tide gauge data can usually be overcome by using monthly or annual sea level means, datum shifts are not so able to be overcome. New Zealand experience indicates that these are by far the most important issues to be resolved if a high quality, consistent tide gauge record is to be produced. By their very nature tide gauge records are fragile and can only be considered to be usable for long-term sea level change studies if there is a long, consistent and reliable datum history. In addition, if there are to be reliable estimates of eustatic sea level rise then any geophysical effects must be able to be removed. As New Zealand reaches the anniversary of a decade of CGPS measurements, it is encouraging to realize that this latter goal is now in sight. Bell, R.G., D.G. Goring, De Lange, W.P, (2000). Sea-level change and storm surges in the context of climate change, Trans., 27(1/Gen), 10 pp., Inst. of Professional Engineers N.Z. Bevan, J., Tregoning, P., Bevis, M., Kato, T., Meertens, C., (2002). Motion and rigidity of the Pacific Plate and implications for plate boundary deformation. J. Geophys. Res., 107(B10), 2261. Chambers D.P., Ries, J.C., Shum, C.K., Tapley, B.D., (1998). On the use of tide gauges to determine altimeter drift. J. Geophys. Res., 103(C6), 12,885-12,890. Denys, P., Hannah, J., Beavan, J., (2009). Tide gauge – CGPS measurements in New Zealand. Proceedings, IAG 2009: Geodesy for planet earth. In press. Douglas, B. C., (1997). Global sea level rise: A redetermination. Surveys Geophys. 18, 279-292. Douglas, B. C., (2001). Sea level change in the era of the recording, in Sea level rise - history and consequences, edited by B.C. Douglas et al, Academic Press, New York. Gornitz, V., (1995). Sea-level rise: A review of recent past and near-future trends, Earth surface processes and landforms, 20, 7-20. Hannah, J., (1990). Analysis of MSL data from New Zealand for the period 1899-1988. J. Geophys. Res., 95(B6), 12,399-12,405. Hannah, J., (2004). An updated analysis of long-term sea level change in New Zealand. Geophys. Res. Letters, 31, L03307. Holgate S.J., Woodworth, P.L., (2004). Evidence for enhanced coastal sea level rise during the 1990s. Geophys. Res. Letters 31, L07305. Hydrographer of the Navy (1969). Admiralty Manual of Hydrographic Surveying, Volume 2. IPCC (2001), Climate Change 2001, The Scientific Basis, 3rd Assessment Report, Cambridge University Press. IPCC (2007), Climate Change 2007, The Physical Science Basis, 4th Assessment Report, Cambridge University Press. Nerem, S.R., Mitchum G.T., (2001). Obervations of sea level change from satellite altimetry, in Sea level rise history and consequences, edited by B.C. Douglas et al., Academic Press, San Diego. Peltier, W.R., (2001). Global glacial isostatic adjustment and modern instrumental records of relative sea level history, in Sea level rise history and consequences, edited by B.C. Douglas et al., Academic Press, San Diego. Pugh, D., (2004). Changing Sea Levels, Effects of Tide, Weather and Climate. Cambridge University Press. Woppelmann, G., (2007). An Inventory of Collocated and Nearly-Collocated CGPS stations and Tide Gauges, http://www.sonel.org/stations/cgps/surv_update.html. Accessed 14 Sept. 2009. John Hannah BSc, DipSci, MSc, PhD, MNZIS, RPSurv, completed his first two degrees at the University of Otago, New Zealand. Two years later, in 1974, he became a Registered Surveyor. In 1976 he began study at The Ohio State University, completing an MSc and a PhD, both in Geodetic Science. From 1982 until 1988 he was Geodetic Scientist, and then subsequently, Chief Geodesist/Chief Research Officer with the Department of Lands and Survey, New Zealand. After a 17 month appointment to the Chair in Mapping, Charting and Geodesy at the US Naval Postgraduate School, California, he returned to New Zealand as Director of Geodesy and subsequently, Director of Photogrammetry for the Dept. of Survey and Land Information. In 1993 he joined the School of Surveying, as Professor and Head of Department, becoming its Dean in 2001. He relinquished this administrative role at the end of 2004 in favour of more teaching and research. His publications reflect his research interests in sea level change and surveying education. He is a Registered Professional Surveyor and is a former President of the NZ Institute of Surveyors.